With the housing bust still fresh in the minds of homeowners and potential homebuyers, it’s not surprising that many professions in the housing industry have a credibility problem. Just how much of a credibility problem may be surprising. A recent survey by Choice Home Warranty found that 67.5% of Americans don’t trust real estate agents. Age was the biggest indicator of whether a respondent was likely to express trust; nearly 70% of people under the age of 44 said they do not trust agents. 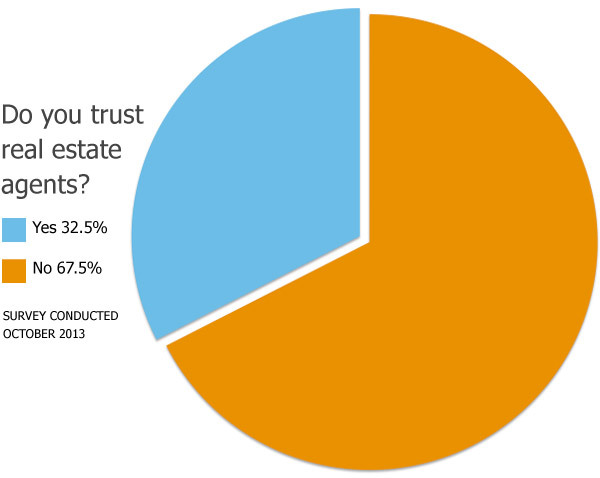 When it comes to surveying who trusts real estate agents, the responses across demographics remains pretty static. Both men and women appear to have the same level of distrust, answering No 69% and 66% respectively. The responses were only separated by 3%, which is within the margin of error. Likewise, regional responses showed little variation from the national average. The Midwest had the highest level of trust with 38.1% of participants answering Yes; the West had the lowest level of trust with only 28.5% saying the same. Again, though, these responses are close to the margin of error. However, population density did have a slight influence on whether participants were likely to trust real estate agents. 66% of city dwellers, those defined as living in Urban or Suburban areas, said they did not trust agents. Distrust jumps to 74.3% for those living in Rural areas. 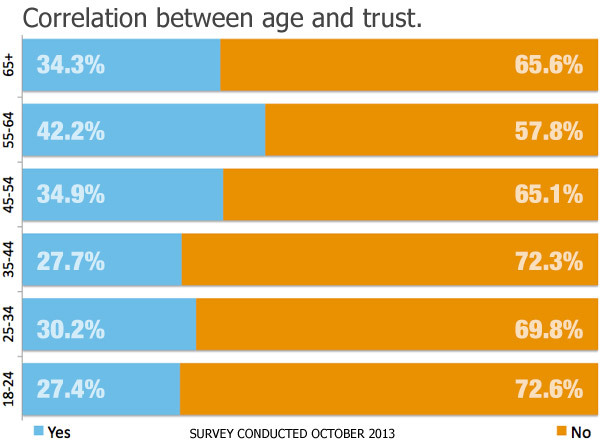 Age was the most positive indicator of trust level for those surveyed. Respondents ages 55-64 were most likely to trust real agents, answering Yes 42.2% of the time. Trust drops to just 27.7% for respondents ages 35-44. There is a slight bump to 30.2% for those in the 25-34 age group. The Choice Home Warranty Survey, “Do You Trust Real Estate Agents,” was conducted online using Google Consumer Surveys October 30, 2013 among 1147 adults (aged 18 and over). Results are weighted by inferred gender, age and geography to reflect the population.